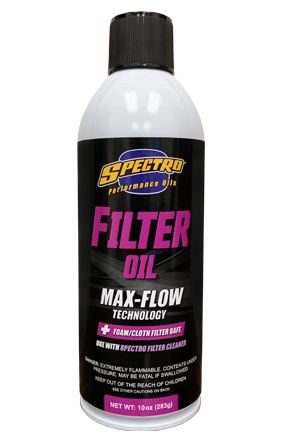 Spectro’s Air Filter Oil technology provides a significant step forward in filter function: its “High Tac” synthetic formula traps and holds dust, even after hours of vibration exposure. With Spectro Air Filter Oil, dust can’t work its way through the filter the way it does with other aerosol products. Use with SX Filter Cleaner for complete filter maintenance. Fast, easy to use — won’t dry out, stays active. Ideal for all OEM and aftermarket air filters. (Do not use on paper types — only on foam or cloth types.) Super tacky “High Tac” technology traps and holds dust.